Peter's Farm - "Wilfred & the Kindom of Letters"
Peter’s Farm is a masterpiece of Children’s music, lyrics and good old fashioned storytelling. The combined efforts of Peter Harmon and David Avery, the compilations have a bright future and are set to become ‘children’s classics’ in the years to come. Peter's Farm is created to inflame the imaginations of children, by taking them on wild adventures where they can meet the friendly Peter's Farm animals: “Silly Billy” the goat, “Daisy" the Duck and a “Piggy Wiggy” the Pig. Their songs are both educational and enjoyable , allowing children to learn and have fun at the same time. The children will learn about farm yard animals, sea creatures as well as learning the dangers but in a light hearted sing-a-long way. 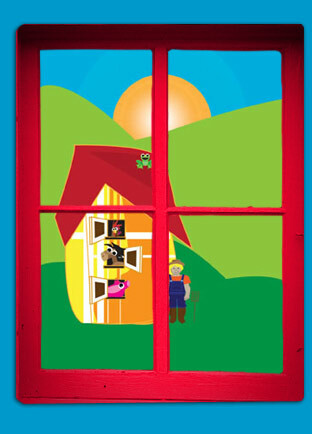 Peter's Farm is a great way to get your kids involved in learning and introduces them to a world of adventure and music.